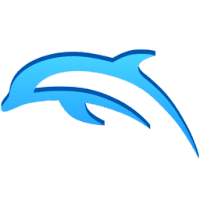 Dolphin is an open-source video game console emulator for the Nintendo GameCube and Wii with support for Microsoft Windows, Linux, Mac OS X, and Android. Dolphin was the first emulator to successfully run commercial GameCube game and later Wii games, and now boasts compatibility with most titles for those game systems. Dolphin allows PC gamers to enjoy games for GameCube and Wii in full HD (1080p) with several enhancements: compatibility with all PC controllers, turbo speed, networked multiplayer, and even more. Disclaimer: Direct downloads for the lastest version of Dolphin 5.0 are provided by the official software's author, we can't guarantee safety, availability or download speed. Moreover, we don't and we won't provide any pirated/illegal versions or tools. We recommend you to avoid it as these methods can harm your device. If you like the software, buy it to support the developers. (We provide software discounts for many worldwide brands).